Philip Trager’s photographic record of New York in the 1970s is his depiction of a city marked by solitude. Fascinated by the architecture of Manhattan, Trager chose to photograph the city with a view camera and large format black and white film, which required a heavy tripod and slow shutter speeds. Often, the effect of this approach is that any person or cars in motion are blurred, and lend a ghostly appearance to his images of the city. Trager’s main interest is the interplay of light and reflections on architecture, and what is recorded are dramatic expanses of empty streets and towering skyscrapers that imbue the city with a quiet elegance. His portrayal is of a city where people are not as important as stately entrances or decrepit brownstones, but a city nevertheless that commands attention with its imposing magnificence and inspires with its grandeur. Trager had an eye for monumental images, from the Gordon’s Gin billboard that dominated 44th and 7th Avenue, to the visual cacophony of Times Square, to the expansive skyline view from the Chrysler Building’s eagle. He also loved photographing in either the early morning or late afternoon light, when the sun is at a lower angle, the shadows are more descriptive, and the shafts of light on architecture and city streets are gorgeously apparent. During the 1970s when Trager created these images he worked at a law office as a second but necessary vocation, but his passion was photography. While living in Connecticut he would travel into Manhattan with his wife Ina (now the subject of a another Trager book, Photographing Ina) in a car loaded with bulky view cameras, lenses, two tripods, and a step stool. He would drive around the city, usually without a set agenda, would stop whenever he spotted an interesting interplay of light, and set up his equipment. Working with view cameras requires diligence, a high degree of skill, and previsualization. The photographer can only view the scene as a left-right reversed upside-down image, and manual focusing requires a magnifier as well as a hood to block the ambient light. Photographing architecture in a formal fashion with such cameras allowed for correction of the verticals to avoid the “keystone effect.” But Trager documented a city that to a certain degree no longer exists. It is a paean to the past. Philip Trager photographed New York City when it still had charm and had not been overtaken by the blight of the 1980s as characterized in the film, Fort Apache, The Bronx, or the slickness of the new century as displayed in Times Square. Anyone who lived in New York City in the 1970s will realize that although the storefront businesses recorded in the book have disappeared and the logos have changed, many of the buildings and their architecture have remained the same. The uniqueness of large format film negatives at the time, either 4x5 or 8x10 inches, was the high degree of detail they recorded. The book is beautifully printed by Steidl with a full dynamic range of black and white. One wishes, however, that the images had been printed much larger, at least to the full-page size rather than limited to the roughly 7 x 9 inch images size that is standard throughout the book. 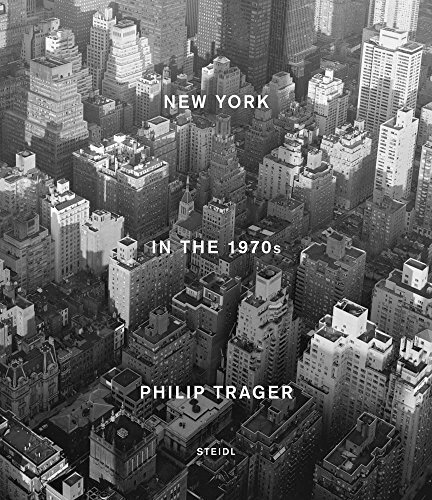 Philip Trager’s New York in the 1970s is a nostalgic photographic revelation of the city as it was, and the magnificence it still possesses.